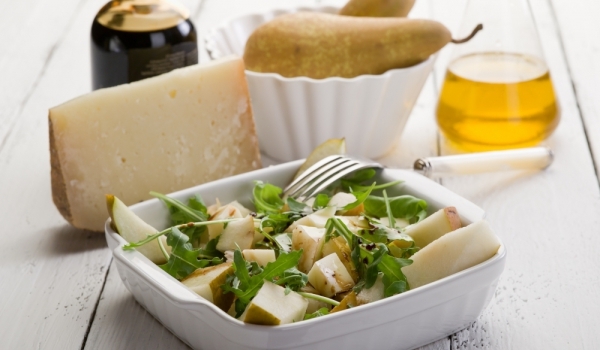 Pears and cheese salad combination, blasting tastes. 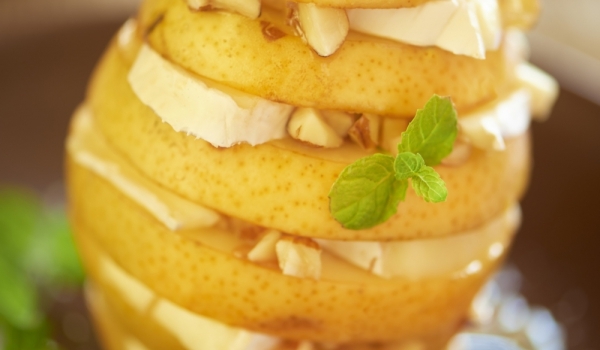 Pear is a unique fruit that is used in cooking from appetizers to desserts, with a combination of sweet and salty. It is an excellent source of fiber, and its bark is rich in antioxidants that help prevent heart disease and certain cancers. – Cardiovascular diseases – peel pears, added to the diet to lower high cholesterol would reduce the increase in blood lipids and increase the concentration of antioxidants in the blood. It turns out even that consumption of whole pear, and not just bark will provide maximum antioxidants. Another study found that eating fruit will have a different effect on the amount of antioxidant capacity and blood lipids in smokers and non-smokers. Daily consumption of fruits / pears and apples with the addition of ¾ cup (200 mL) orange juice / sharp increases antioxidant capacity among non-smokers. In smokers, scientists observed lower blood lipid. Pear is a source of dietary fiber, important in the regulation of intestinal transit and prevention of cardiovascular diseases. About two-thirds of the fiber in pears are fibrineraztvorimi. The bark of pear contains more fiber than its mass. More antioxidants in organic pears? According to the studies organically grown pears have higher amounts of phenolic compounds in comparison with conventional pear crops, in which there is the use of pesticides. Pear contains sorbitol and fructose sugars, which can cause gastrointestinal discomfort (gas, bloating, abdominal pain, diarrhea) in susceptible individuals. Individuals with irritable bowel syndrome are particularly vulnerable. In adults discomfort can be felt when taking 10 grams of sorbitol per day (corresponding to about 2.5 medium pears). A daily intake of 50 grams or more of fructose can also cause diarrhea (equivalent to about 5 medium pears or 2 and a half cups (625 ml) pear Nectar). Among children, the consumption of juice or nectar pear can be a cause of chronic diarrhea / idiopathic, of unknown origin /. Babies can also have intolerance to pear juice. If gastrointestinal symptoms develop, it is important to check whether refers to these beverages. The consumption of pears might appear syndrome oral allergy. This syndrome is a form of allergic reaction to certain proteins from a variety of fruits, vegetables and nuts. It often affects people with allergies to pollen environmental and almost always preceded by hay fever. In people with allergy who consume raw pears (the heat treatment usually degrade allergenic proteins) may occur itching and burning sensation in the mouth, lips and throat. Symptoms may appear and then disappear, usually within minutes after eating or touch of the finger. In the absence of other symptoms this reaction is not serious and pear consumption should be avoided systematically. However, it is recommended to consult an allergist to determine the cause of reactions to plant foods. The latter will be able to assess whether you should take special precautions.